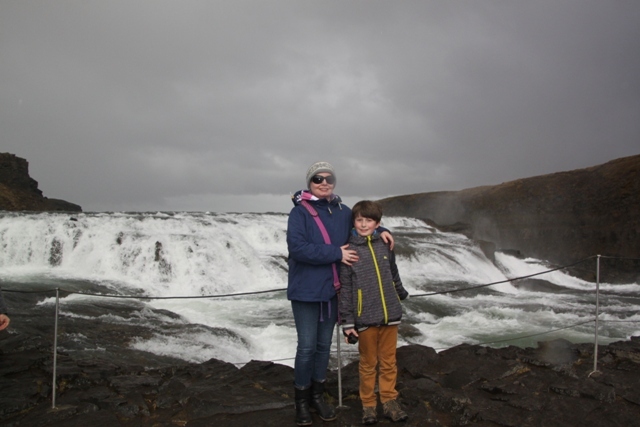 Gullfoss is the last stop on the Golden Circle – I think it is definitely a case of saving the best till last. 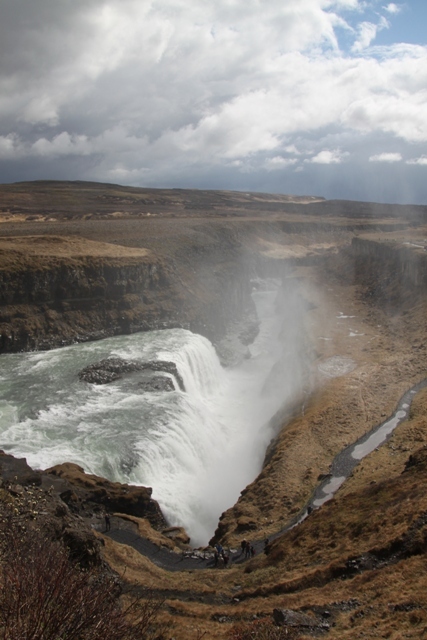 Just fifteen minutes drive away from Geysir is the most amazing waterfall that is Gullfoss. As soon as we parked up, a huge black cloud settled overhead and it poured with rain. Husband wanted to brave the wet and walk to the waterfall. He was over-ruled by both the other members of the family, democracy rules in our house. This left him decidedly grumpy, but we stood firm. He was fidgety and in the end we sent him to the shop to buy chocolate. We ate this, watched the raindrops on the window and waited for the storm to pass. When it did, we headed for the waterfall, smug and keen to rub it in, that the right choice had been made. This is definitely my kind of waterfall. I have visited other waterfalls in other countries, all of which seemed to involve strenuous hiking to get to either the bottom or the top. 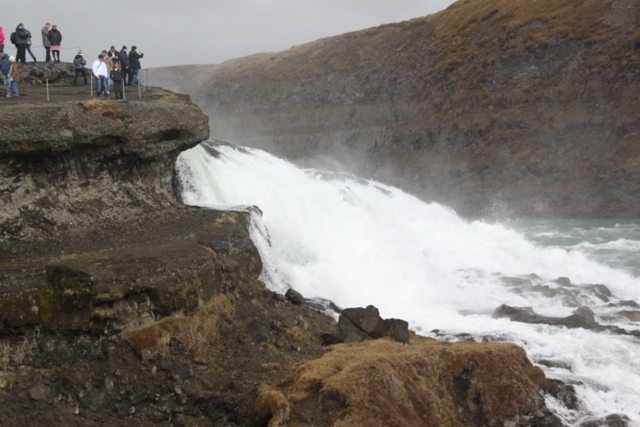 None of that at Gullfoss. We walked just a little way from the car park, along a boardwalk and there was the waterfall in all its splendour. 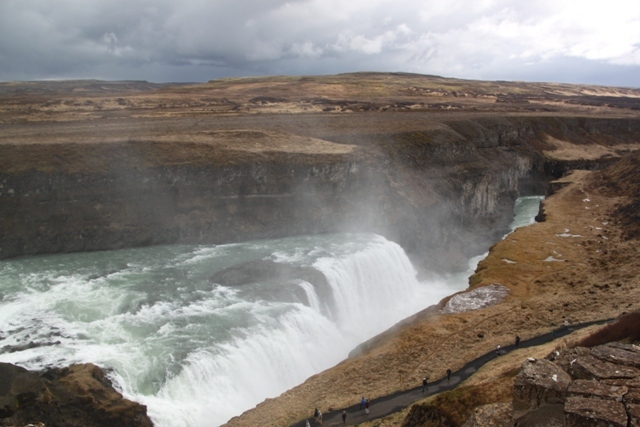 Gullfoss is absolutely stunning. 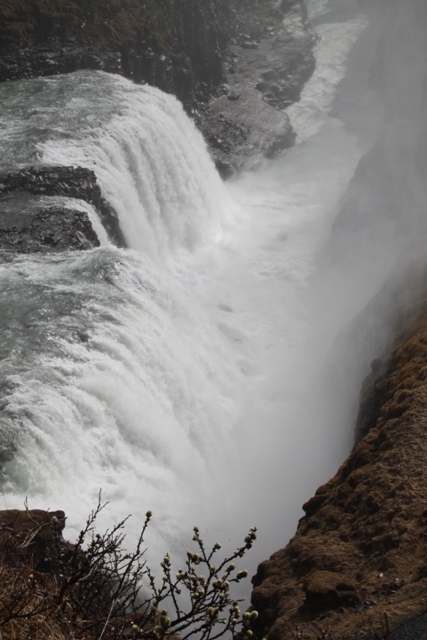 It is massive, spans a huge river and makes several drops as it sprays mist on those who come to look at it. 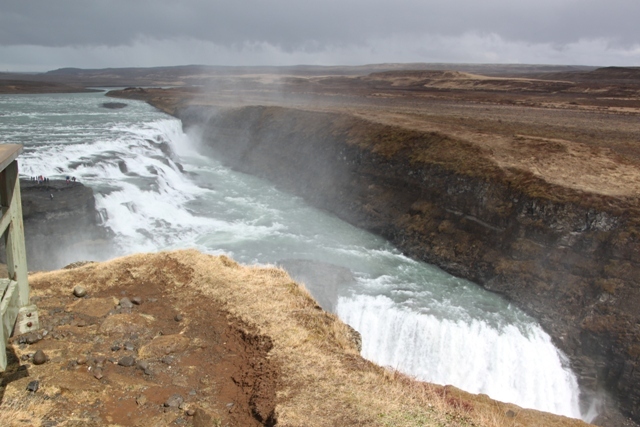 Some say it is Europe’s best waterfall – the average flow is a mind blowing 109 cubic metres per second. 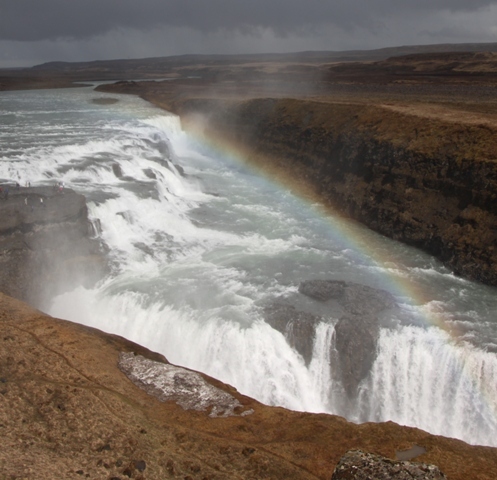 As we looked at it from the top, we saw a rainbow form right across the falls – stunning. We walked down to the lower level, got drenched with spray but it was worth it for more awesome views. A bit of a problem after we got back to the car – it wouldn’t start. We had to be rescued by the hire car company – but this took 3.5 hours. A series of improvised games had to be thought up to keep our 9 year old entertained, it is amazing how creative you can be with an empty bottle of Sprite! Eventually we were sorted out with another car and headed back to Reykjavik. The drive was along empty roads, over a mountain pass with lots of snow and then the city crept into view. It was 10:30 pm but the sun was shining and the skies were blue. We were so hungry – there was nowhere to stop for food on the drive back, so we quickly parked and tried to find the closest restaurant. A lot of restaurants near our apartment seemed to close at 8:30 or 9:00 pm latest. The only place we could find still open was a pizzeria – it looked less than ideal, but with no other options we went for it. What a surprise! The pizzas were delicious. I ordered one called a volcano – check it out. As well as looking great, it was gorgeous. The 9 year old declared this the best meal we’d had since we arrived in Iceland. Eldsmidjan was the name of the restaurant – good value, great food and worth checking out. 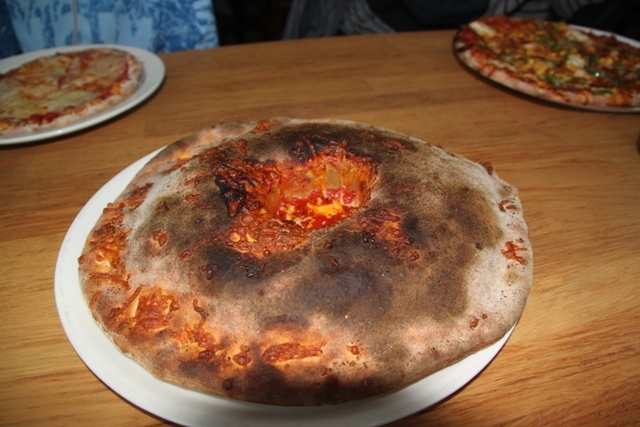 That is one strange pizza! Well named, though. Love your photos. I will see this in a little more than a month! Strange but really good! Thank you and hope you enjoy Iceland. The photo’s are really good, especially the first one. I bet the noise of the waterfall was deafening. We would like to travel here one day. 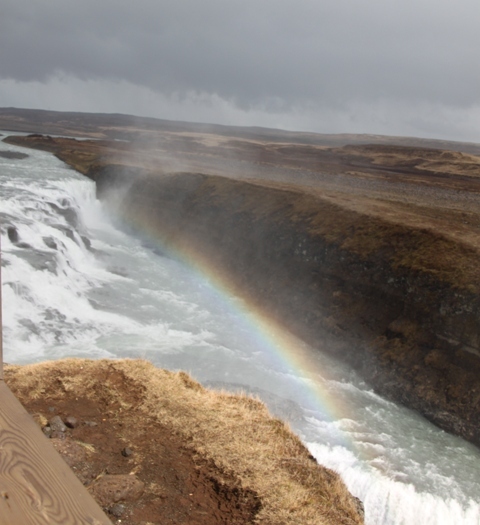 Thank you – it is a spectacular waterfall in an amazing setting, definitely worth a visit. 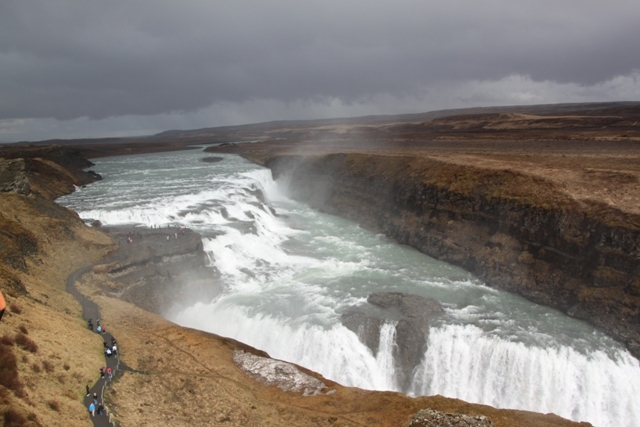 Oh, Gullfoss, the mighly waterfall! I remember perfectly, we also got a rainbow in some of our pictures :). I was so happy to snap that rainbow! It is beautiful here isn’t it, nature at its finest.